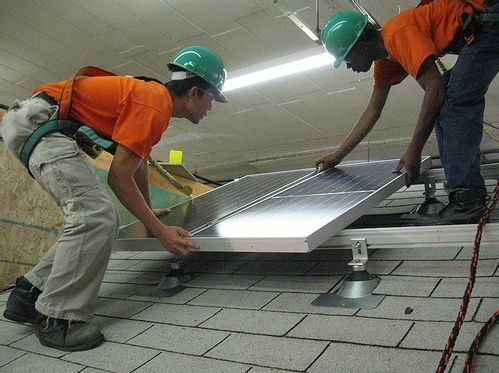 The Oakland initiative provides college-credited training in green construction, solar installation, and energy audit--followed by paid on-the-job training and full-time employment. In addition to receiving a certificate or diploma, students are eligible for full federal financial aid. Visit the Cypress Mandela Training Center website for more information about the Oakland Green Jobs Corps. Green Jobs State Stimulus Funds: $937,511 to Peralta Community College District to provide the city unique opportunities to help at-risk young people develop job skills for the emerging green economy. California Clean Energy Workforce Training: $1 million to Laney College to train low-income, unskilled and dislocated workers in energy efficiency, renewable energy and renewable transportation technology. On the Job Training Support Services: $55,000 to Cypress Mandela Training Center to supplement federal training programs and support the training programs of state departments of transportation for highway construction contractors, apprentices and trainees. Oakland's "Green Retrofits for All" schematic highlights one strategy for Oakland to use Recovery Act funds in developing sustainable jobs and environmental and community infrastructure. For more information on Stimulus and the American Recovery and Reinvestment Act, visit Oakland's Economic Stimulus website.